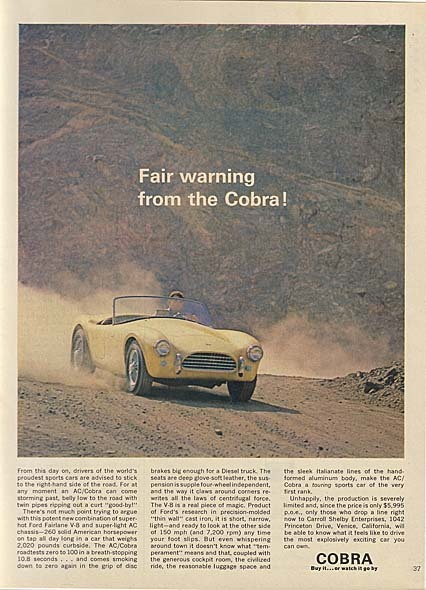 AC/Cobra - Full color 7 3/4" x 10 3/4" ad that gives other drivers in the world "Fair warning from the Cobra!". There is a picture of a Yellow Cobra leaving a trail of dust as it easily handles a hilly dirt road. The text talks tauntingly about the super-hot Ford Fairlane V-8 mounted in the super-light AC chassis which provides "260 solid American horsepower" in a car weighing 2,020 pounds. It mentions the disc brakes, the soft leather seats and hints at over 150 mph and 7,200 rpm. It warns that "production is severely limited" at this time but, with a price of only $5,995, it was certainly worth it to "drop a line right now to Carroll Shelby Enterprises". Ford Mustang - Full color 10" x 13" ad for this Award-Winning New Car. There is a large picture that shows a White Ford Mustang Hardtop against a black background with a formally dressed couple standing behind it paying as much attention to each other as they are to the car. The headline says "New Ford Mustang $2368 *f.o.b. Detroit" which, as the text explains, does not include destination charges, taxes or whitewall tires. The text lists many features that are standard on this car and more that can be had for an extra fee including a 260 or a 289 engine. There is mention too of an authentic scale model of this car that was available from Ford for $1.00. Ford Mustang - Full color 9 1/2" x 13" ad that intoduces the "New Ford Mustang" priced at $2368 *f.o.b. Detroit. The ad has a picture of a White Ford Mustang Hardtop with a male and female occupant pointed in a slightly uphill position with a field of blue and pink in the foreground. The text talks about this being "the car you never expected from Detroit" and mentions being the first car to be awarded the Tiffany Award for Excellence in American Design. It mentions too that the price mentioned does not include destination charges or taxes and that whitewall tires are $33.90 extra but that it does include luxury items that are either unavailable in other cars or available at extra cost. It also mentions some of the options that will allow you to "design Mustang to suit your special taste for elegance" with a special mention about the 289 cu. in. engine and the Rally-Pac package. Mustang - Full color 9 1/2" x 12 1/2" ad shows a Mustang parked by the stage door as a bored young lady waits for her her male companion to stop signing autographs for his adoring fans. The ad headline explains that "Wolfgang used to give harpsichord recitals for a few close friends. Then he bought a Mustang". The text seems to give some credit for his fame to the fact that he is now receiving incentives from his car. Mustang Convertible - Full color 10" x 12 1/2" ad shows a Blue convertible parked with it's top down on a hill overlooking a panoramic San Francisco. Next to the car is a well dressed gentleman about whom the ad tells the story about how buying a Mustang changed poor Bernard's luck for the better. It talks about the car being sporty and luxurious yet practical which is enough to change anyone's luck. It says that Lucky Bernard chose the sporty options such as the 289 cu. in. V-8, the Four-on-the-floor and the Tachometer and clock combo. Maybe buying this car had nothing to do with Bernard's luck but "Yesterday he won San Francisco in a faro game. And now he's got his eye on New York". Mustang - Full color 9 1/2" x 12 1/2" ad that tells another story of a life being changed for the good buy buying a Ford Mustang. The ad has a picture of Desmond sitting on a park bench with his Dark Blue Ford Mustang Hardtop parked where he can see it. The ad headline explains that "Desmond was afraid to let the cat out...until he got his Mustang" and now he sits there carefree with his hat spinning on the end of his finger. The text mentions features such as bucket seats, floor shift, vinyl interior, padded dash, full carpeting and more. As a result of getting this Mustang Desmond was able to trade in his Persian kitten "for an heiress named Olga". Sounds like a deal to me. Mustang GT - Full color 19" x 13 1/2" two-page ad that discusses the similiarities between the Gord GT and the Mustang GT. The smaller, top photo in thes ad shows a Green Ford GT competing in the Daytona 2000 kilometer endurance classic and comments on the performance features built into this car. The bottom, larger photo shows "The car it inspired - new Mustang GT" parked on a dirt road. The text talks about the many features that were provided in the GT package including the GT insignia on the front fenders. The ad mentions that it has the "Unique Ford GT stripe - badge of America's greatest total performance cars!". Ford Mustang GT Hardtop - Full color 9 1/2" x 12" ad has several photos of a White GT with red stripes along the rocker panel. There is one large photo of a lady wearing a cowboy hat leaning against the side of the car and five photos that show different views of the white interior with captions calling attention to the "New sports steering wheel", the "Handsome inserts of embossed vinyl", the "New luxury instrument panel", the "New integral arm rests - courtesy lights" and the "New luxury interior for Mustang".. The ad headline describes the "New luxury interiors, new GT performance package for America's favorite sports car" and the text lists quite a few of the items available with your Mustang. Ford Mustang Hardtop - Full color 9 1/2" x 12" ad that is trying to tell you just how much owning a Ford Mustang will change your life. The ad has a picture of a Cream-Colored Ford Mustang Hardtop that is parked on a dark pavement. Standing next to the car is a beautiful lady in a pink dress who is holding her pink shoes in her hands as she looks with joy at a man in a dark suit who is standing with his back to the camera. The ad text claims that "Two weeks ago this man was a bashful schoolteacher in a small mid-western city. Add Mustang". The ad claims that with the purchase of this car came three steady girlfriends as well as familiarity with the best headwaiter in town. Mustang Hardtop - Full color 9 1/2" x 13" ad has a picture of a lady dressed as a bullfighter standing in front of her Red Ford Mustang Hardtop and staring with a "Do you dare?" look on her face at the camera. The ad headline warns that "If they're still waiting for Agnes down at the Willow Lane Whist and Discussion Group, they'll wait a long time". 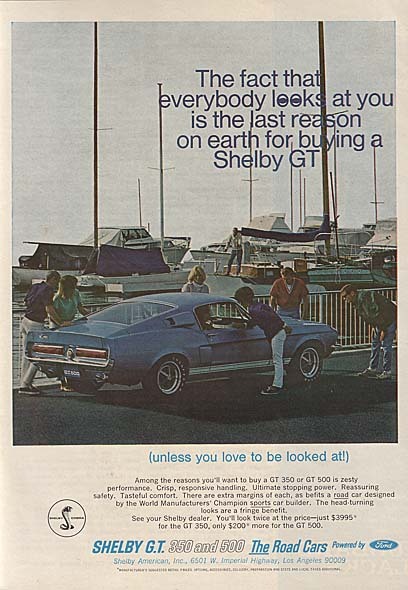 The ad text explains that "Agnes hasn't been herself since she got her Mustang Hardtop". It goes on to mentions some of the features of the car that Agnes bought including a "fire-eating 200 cu. in. Six". It claims that "Mustang is more car than Willow Lane has seen since the last Stutz Bearcat bit the dust" and warns that "Agnes has a whole new set of hobbies, none of which involves cards". Ford Mustang Hardtop - Full color 10" x 13" ad has photos of three different color Hardtops. The ad headline asks "If you thought we couldn't improve on a winner - try Mustang '66!" and they claims that "the changes are subtle but significant." They list many of the standard features, including the Stereo-sonic tape system, and mentions the GT options as well as theCobra V-8. Ford Mustang Hardtop - Full color 9 1/2" x 13" ad that asks the question about who should be allowed to drive this car. At the top of the ad is a small photo of a gray-haired business man in a blue suit, holding a newspaper under his arm and pulling his glasses down so he can see what he is trying to look at. The ad headline asks "Should a man in his 50's be allowed out in a Mustang?" At the bottom of the ad is a larger picture of this same man, dressed in casual clothes, with a big smile on his face as he prepares to drive away in his Light Blue Mustang Hardtop. Ford Mustang - Full color 9 1/2" x 12' ad that calls attention to the Gas Economy owners of this car were treated to. The ad has a photo of a young girl sitting in her new Dark Blue Mustang waving out the driver's door. The ad headline reminds you, and her, "So you chose a Six for your Mustang! Congratulations. Now don't forget to wave when you pass your gas station...(someday you might have a flat)". The text talks about the "big, hot 200-cu.in. Six" and brags about this car not needing "unnecessary trips for routine maintenance (just about every 6000 miles or 6 months is enough.)". It also mentions the items that come standard in the basic Mustang which they refer to as "dash plus savvy". Ford Mustang - Full color 7 3/4" x 10 3/4" ad with a two photo sequence of events. The first is of a young lady in a white dress sitting on a park bench. The ad headline has her thinking "I think I'll slip into something racy for Harry". The second photo has her sitting in the passenger seat of a Dark Blue Mustang with the driver's side door open, waiting for Harry. Mustang - Full color 9 1/2" x 12 1/2" ad for the Three New Ways that the Ford Mustang are available to you. Pictured in the ad are a Red Hardtop where a couple dressed in red wet suits are about to skin dive, a Black Convertible with the top down parked where the two couples that came in the car can enjoy the scenery and a White Fastback that is parked at the beach and it and it's female passenger are being admired. The right hand side of the text is nothing but options that the buyer could pack into his new Mustang to personalize it even more. This ad is the same as the previous ad but in a larger size. Mustang - Full color 10" x 13" ad that encourages the reader to be responsible and to "take the Mustang Pledge". The ad shows a blue Mustang at the top of the page with a pretty blonde smiling as she looks back while raising her hand to take the pledge. The text has two colmns with "I Will Not..." at the top of one column and "I Will" at the top of the other. The Will Not column contains items like selling tickets to people wanting a ride, keeping the neighbors up all night by playing the stereo in the car, not yawning when other people talk about their cars and turning on the map lights in the Mustang's overhead console during the daytime hours in an underhanded attempt show it off. The Will column has items such as telling the truth about the low price of a Mustang and not bumping it up, use the money saved when buying your Mustang on yourself, pay attention to the Convenience Control Panel, despite the fact that the Tilt-Away steering wheel allows easy access to an oversized belly continue to watch your diet, only shift manually when by yourself in order to retain that helpless-female look and catch up on your diary - someday. Mustang - Full color 9 1/2" x 13 1/2" ad that reminds us that the Original is still the Best. There is a picture of a Red Mustang in front of an oversized hand in a similar boxing glove that has a Mustang emblem attached to the palm. The headline urges you to "Strike a blow for originality! (Take the Mustang Pledge.)" and below the car are the words claiming that it is "Still the original and lowest-priced car of its kind with bucket seats." Ford Mustang Fastback GT - Full color 10" x 13" ad shows a red Mustang Fastback GT parked on a beach while a smiling lifeguard standing next to it is hugged by three ladies in swimsuits. The sequence of pictures at the top shows Sidney changing from a suit and tie kind of guy into a somewhat of a manly guy who is appealing to women and the headline assures us that "Only Mustang makes it happen!". The text tells the story of Sidney's early days which were spent seashelling at the seashore but then he noticed the '68 Mustang. The low price "left Sidney lots of clam to design his own Mustang, Sidney style". Now his days at the beach are spent saving bathing beauties from drowning, easy to do when they can swim better than you can. Shelby Cobra GT 350/500 - Full color 7 3/4" x 10 3/4" ad for the car that was designed to do what it looks like it could. The headline claims that "Carroll Shelby designed his Cobra GT to go like it looks" and the text takes off from there just rolling off amazing options and impressive performance features. The three pictures in the ad show a Blue GT500 on a hill overlooking a wide expanse of water, an interior shop ot the impressive dashboard and a shot of the rear end of a Red Cobra with an attractive girl with a bathing suit that has just as many pieces as tailpipes coming out of the back of this car. Shelby Cobra GT 350/500 - Full color 7" x 10 1/2" ad with photos of a Blue GT 500 convertible being driven along the beach with the surf in the background, the front view of probably this same car and an overhead view of a Red Fastback parked on the sand. The ad headline asks you to "Try the complete surprise...Carroll Shelby's Cobra GT" and the text goes into exhilarating detail about these hand-built cars..
Mustang Mach I - Full color 19 3/4" x 13" Two-Page ad with a side-view photo of a Red Mach I parked with a couple leaning against the driver's side looking back at the camera. There is a smaller photo of a 1964 Mustang and the headline warns that "If you haven't got a past yet...get a Mustang. Now." Each page of this ad is larger than my scanner bed so the outer edges of the ad will not be visible in the scanned view. Performance Mustangs - Full color 8" x 10 3/4" Three Page ad that discusses the Mustangs that don't just LOOK good. 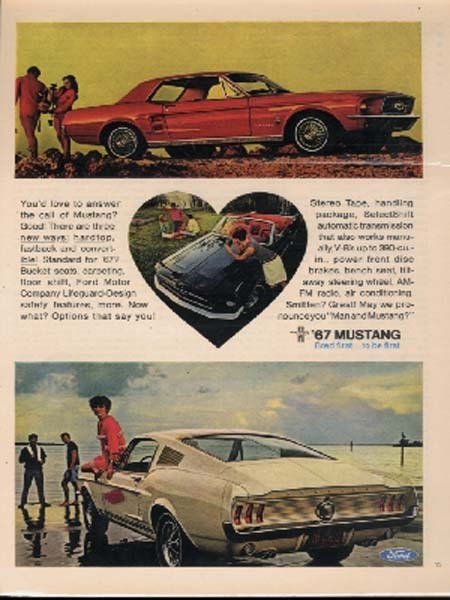 The first page has three different views of a 1969 Mustang Mach I with a headline that claims that "Ford has a Corner on Performance for 1969!". The text explains that this is a literal statement since each "Ford Dealer has set aside a part of his showroom for the hottest Fords going". The text on this page continues by discussing the options available on the Mustang Mach I including either the 351 cube V-8 or the 428 Cobra Jet V-8 (Ram or non-Ram). The next two pages talk about the Big Brother, the Cobra. The headline introduces "Cobra: brought up in a tough neighborhood (Daytona, Darlington, Riverside)". Pictured on these pages are the 1969 Cobra Hardtop with Optional 428 CID Cobra Jet Ram-Air and the 1969 Cobra Sportsroof. The text calls these the 1969 Boss Snake and claims they are "blood brother to the specially modified Torinos that let it all hang out on this year's NASCAR circuit". It goes into details about what is a stock machine, for a Cobra, and what else you can add to the package. It mentions that all of these options were available for either body style. Mustang Mach I - Full color 10" x 13" ad shows this sporty red Mustang parked on an airport runway in front of a helicopter and a beautiful lady. "Number One, There's Mustang". Ford Mustang - Full color 7 1/4" x 10 1/2" ad that talks about how owning a Mustang will allow you to be what you want to be. There is a picture of a gray Mustang parked on the banks of a river while the couple that drove up in it enjoy the solitude as the woman finishes a swim. The headline states "Mustang. It's a personal thing" and the text tries to explain why this is true. It wonders if it is because of the many choices available such as six engines and a book full of options. Or it wonders if it is not because of the modern instrument panel, the NASA-inspired hood scoops or the proud new profile? The end up deciding that it is because that the Mustang is greater than the sum of its parts and urges you to check at your dealers and see for yourself. Ford Mustang Hardtop - Full color 9 1/2" x 12" ad for the Spring Sale of Mustangs with a stripe. The ad has several photos of a red Mustang with black stripes accessorized with an attractive young lady who is wearing a red outfit with black stripes. The ad headline states "For Spring Only. A Mustang of a New Stripe" and explains that the Mustang Hardtop was being offered with the Boss Tape Stripes, a Sports-car Hood, NASA-type scoops, dual racing mirrors, color-keyed Spoiler bumber, a Unique Grill with Sport Lamps and Wide Tires with Special Trim Rings. Mustangs - Full color 10" x 13" ad that that compares snow sking to driving a Ford Mustang, There is a picture of a Green Mustang at the bottom of the page with the image of a man adeptly sking above it. The headline asserts that "Control and balance make it a beautiful experience" and the text talks about the Motion under Control that you enjoy with a Mustang and talks about some of the features that a Mustang has to get the control. It also mentions by name the five models that were offered this year. Ford Mustangs - Full color 9 1/2" x 12 1/2" ad that compares driving a Mustang with riding a surfboard along the waves. The ad headline, which refers to both, claims that "Control and balance make it a beautiful experience". Shown at the bottom of the wave that the surfer is riding are a White Mustang with a Sportsroof and a White Mustang Hardtop. Both of these cars are shown with the Sprint Decor Option and the text mentions many options that are inside or underneath. Ford Mustang - Full color 7 3/4" x 11" ad for some of what makes a Ford Mustang a popular car. 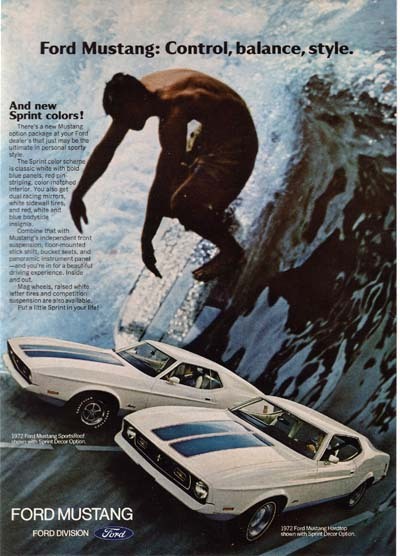 There is a picture of a man surfing a large wave in the background of the ad with the headline "Ford Mustang: Control, balance, style" before adding the words "And new Sprint colors!". At the bottom of the ad are pictured the 1972 Ford Mustang SportsRoof with the Sprint Decor option and the 1972 Ford Mustang Hardtop with the Sprint Decor option. The text talks about the Sprint packages that were offered and ends with features that every Mustang shares and is proud of. Mustang II T-roof Convertible - Full color 7 1/2" x 10 1/2" ad that talks about how the excitement is back now that "The Convertible Kick is Back". The ad has a picture of a couple leaning against their Yellow Mustang II that has the T-roof removed. The headline over this couple has them saying "A flame went out when old-style convertibles died. But now I'm all lit up again" and the ad has another picture of them driving this car with the sun visible over their heads. Ford Mustangs - Full color 9 1/2" x 12" ad for "a sports car for the '80s". The ad has a picture of a White Mustang 3-door and a Red Mustang 2-door parked and waiting for drivers. The ad claims that the Mustang is now "Certified by the U.S. Auto Club as a sports car", that it has both "Sports Car performance and Impressive fuel economy" and that with the options available you can "Design your own Mustang".